Our society is currently facing a democratic crisis reflected in a strong abstention from recent elections as well as a progression of individualism, wherein sometimes even the social link is monetized. In light of this, it seems urgent to move away from the model of permanent competition and turn to more cooperation. Solutions exist to improve people’s lives and to respond to the great societal challenges of our time. Following the principle of “think global, act local,” “co-citizens” organize themselves and invite us to rethink our way of living together. For us, the expression “co-citizens” represents the collective spirit found in these groups of individuals acting for sustainable, inclusive, and lively cities. Dispersed and sometimes barely visible, these local initiatives are multiplying and waiting to be reinforced and unified to begin a democratic, ecological, and human transition. Goteo is a platform for civic crowdfunding and collaboration on citizen initiatives and social, cultural, technological and educational projects. Goteo has replicas and alliances in several countries, thanks to its open source code as well as the awards and international recognition it has gathered since 2011. It is a tool for generating resources ‘drop by drop’ for a community of communities consisting of over 65,000 people, with a funding success rate over 70%. Voor je Buurt is the first crowdfunding and crowdsourcing website for civic projects in The Netherlands. Using Voor je Buurt’s platforms, citizens, communities, social entrepreneurs and NGO’s can fund local projects with a social impact. Think of projects like local festivals, community centers and temporary use of public space. As one of the first civic crowdfunding organizations worldwide we prove crowdfunding for local civic projects to be successful. We are the fourth largest civic crowdfunding platform in the world. We enable and coach civic projects in their crowdfunding campaign and cooperate with local governments, charity funds and companies. 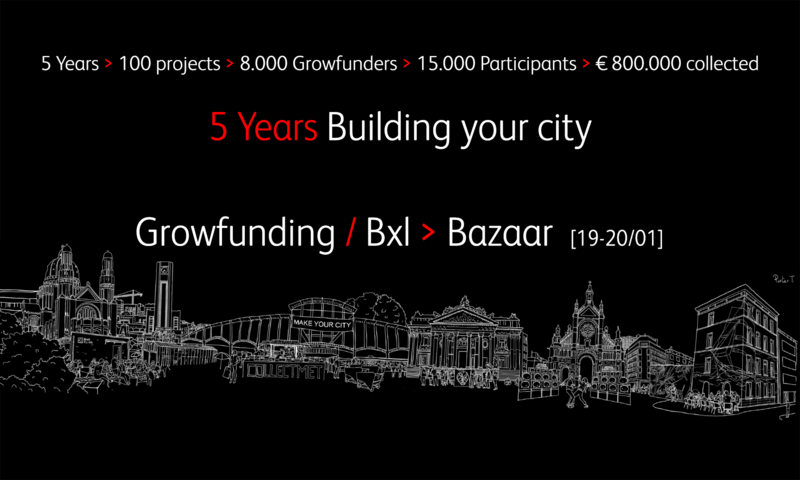 Thanks to Voor je Buurt, initiators can raise funds by use of their entrepreneurial and networking skills. Crowdfunding is not just an online tool to raise money, volunteers and materials, but also a way to build a community around a project. Contributing to a project results in shared ownership of the project, and we notice that financial supporters often stay involved. As such, the process of crowdfunding makes transparent what happens on a local level, whether there is support for new ideas, and what funding sources are possible. Civic crowdfunding can radically change the relationship between local governments and civic initiatives. The municipality no longer functions as a gatekeeper who decides whether an initiative gets permission and funding, but, instead, citizens take matters into their own hands. Municipalities take up the role of an equal partner who can cooperate to realize an initiative. Local governments increasingly hand over tasks and responsibilities to civil society. Voor je Buurt anticipates on this development. We cooperate with local governments, charity funds and companies to take up an active role in civic crowdfunding. For example by training citizens and professionals in civic crowdfunding, starting a local of thematic platform or by becoming a matchfunder. Matchfunding is an alternative way to distribute subsidies for social projects by contributing to crowdfunding campaigns. This way municipalities can strategically change their funding instruments to stimulate civic projects to use crowdfunding. Spacehive is a funding platform for projects that make local places better: from sprucing up a local park, or holding a community festival, to reviving a disused building. We enable project creators to attract funding from local people, companies and councils via the same platform. What’s a local project? Is my idea eligible?Spacehive is for creating or improving places used by the community. It doesn’t matter who owns the land or building – the key thing is that it’s not just you that benefits from the project. What is all-or-nothing funding?Spacehive has an all–or–nothing funding model, which means that if you don’t hit your target none of the pledges are collected. This can seem daunting but it works – our projects have an unrivalled average success rate of 49%. We add a 5% fee to the amount projects need to raise which we collect if, and only if, they hit their target. Our fee pays for us to build and maintain our platform, support our project creators and backers, and integrate funding streams that help our projects to succeed. Patronicity brings together local citizens and sponsors to support great initiatives in their communities, eliminates cost inefficiencies and improves the granting process by creating a transparent model that is easy to understand and use. The Michigan Economic Development Corporation is partnering with Patronicity to revolutionize the way grants are applied for, evaluated and approved. Through the Public Spaces Community Places grant, projects that qualify receive matching dollars to those crowdfunded. MassDevelopment has launched it’s Commonwealth Places program & the Indiana Housing & Community Development Authority has launched the CreatINg Places program to drive and strengthen community and economic development through activating new or distressed public spaces. La Ruche is a non-profit organisation and its mission is to encourage the emergence of projects stimulating the influence and vitality of a given area. Through its proximity crowdfunding platform, La Ruche actively contributes to the development of new projects in the province of Quebec. Crowdfunding is a type of funding that allows a project to come to life with the support of a community by gathering a substantial number of financial contributions, no matter how small taken individually. On top of the personal satisfaction contributors get from this experience, they can receive perks offered by promoters (exclusive products, special offers, discounts, etc.) depending on the nature of the project and the size of the contribution. La Ruche is innovative through its non-profit organisation structure, the personalised guidance provided and the concept of regional proximity it promotes. La Ruche assists your crowdfunding project and counts on the support of a group of SM40 Ambassadors in each area who act as advisors during Cells. They share their expertise and improve your campaign.